No, I did not have a seizure while typing out the title of this blog. It’s actually the title of a spoof film coming soon to DVD and Blu-ray. 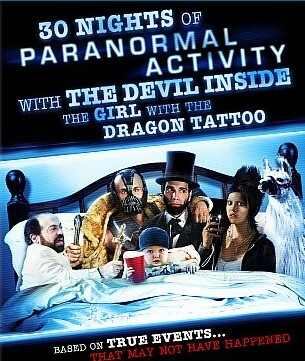 30 Nights of Paranormal Activity with the Devil Inside the Girl with the Dragon Tattoo is Fox’s latest mock movie that makes fun of the latest big films. A big ol’ mixed bag of crazy. And on January 15, 2013 this long-titled film can be yours. Check out the details and trailer below. The one and only bonus feature for this flick is available on Blu-ray only and it is: Behind the Scenes of 30 Nights of Paranormal Activity with the Devil Inside the Girl with the Dragon Tattoo. What do you think? Is this a flick you’ll pick up? Personally, I will be passing. I have never been a fan of spoof films.